Thomas Carter. Building Zion: The Material World of Mormon Settlement. Minneapolis: University of Minnesota Press, 2015. 408pp. The standard narrative of the settling of the Great Basin by members of the Church of Jesus Christ of Latter-day Saints asserts that the Mormons moved west to craft a radically different society. Polygamy, theocracy, and communal economics dominate an understanding in which Mormons only acquiesced to American norms after intense outside pressure. The railroad came in 1869, followed by a federal crackdown on polygamy, which swept through the territory until the practice was officially abandoned in 1890. 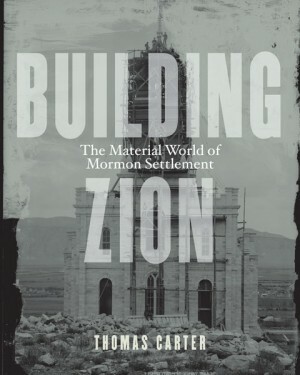 In Building Zion: The Material World of Mormon Settlement, architectural historian Thomas Carter hopes to add nuance this story, showing that Mormons actually experienced Americanization rather slowly and were never really as far from the mainstream as the stories about them suggest. Mormons were building their “Zion,” but the material world of Zion’s cities looked similar to the rest of America. Carter openly admits he is not the first scholar to claim Mormon difference was never as stark as prior rhetoric suggested, but rightly highlights the lack of reception for the refrain. To make this subtle narrative more transparent, Carter reads the built landscape of Sanpete County in Utah from its settlement in the early 1850s through the completion of the Manti Temple in 1888. Sanpete’s location an hour south of the Wasatch Front makes it a fine case study, as it sits squarely inside the Mormon cultural region and lacked the major non-Mormon interactions present in Salt Lake City and environs. Through meticulous illustrations—inset photographs, maps, elevations, and floor plans—culled from fieldwork carried out in the late 1970s, as well as public sermons and private correspondence and journals, Carter documents the physical and cultural histories of buildings planned and constructed in the mid-nineteenth century. His approach oscillates between surface readings of the landscape and attempts to understand what these settlers imagined they were building. He builds his case against the background of three fundamental Mormon myths: the radical millennialism that quickly cooled, the gospel of works that associates economic development with righteous living, and the continuing revelation that makes major cultural transitions palatable. He sees the decision of church leaders in the early 1870s to move planned temples from the heart of downtown to the outskirts of town as a vital one. This shift, Carter claims, dramatically reoriented the conception of Zion away from a holiness that encompassed the whole landscape to one that focused on a single, sacred, fixed point. By setting the temples outside of town and on a higher elevation, the Mormons highlighted the building’s unique status as well as showcased their separation from everyday buildings. Carter remains focused on the macro level of design: urban layout, domestic, commercial, and ecclesiastical architecture. He draws connections between Mormon trends and broader American ones, carefully noting where the appearance of similarity might indicate convergent evolution rather than mere copying. For example, the Mormons’ interest in neoclassical symmetry and grid-based cities echoed trends beyond Utah, yet seem to have been independently developed. As their domestic architecture makes evident, Mormons were fixated on refinement in all areas and even had “a love affair with capitalism and consumer culture” (107). They were not ascetic communalists divorced from the norms of American house design, but rather individuals who heard the constant refrain to build “good houses” and understood it to mean the high quality homes popular throughout America. The broader American norms of fine workmanship and a layout of bedrooms clearly set off from parlor and a kitchen in the back of the house all appear throughout Sanpete County. Yet minor differences, like open plans in almost all homes, speak to how Mormons bent these norms in ways only the most careful observer would note. Carter convincingly elucidates these nuances, which makes the work valuable for anyone interesting how minority groups walk the line between distinction and abjection. At times, Carter gets carried away in the biographical details of his Sanpete County subjects, especially in the chapter on polygamy, in which he recounts dates of marriages and number of children for several couples, without deploying these facts as part of his reading of the landscape. Despite stories of husbands having to build separate homes for quarrelling wives, he admits that polygamy’s brief practice, from 1852 to 1890, had very little lasting or visible effect on Mormon structures. Additionally, his intriguing claim about the boundary of Zion moving from the communal body to the individual body would have benefited from more proof. The diversity of styles in every type of structure from houses to churches to businesses he finds in Sanpete County alone also raises questions about just how generalizable his claims are for Mormon settlement generally. Despite these oversights, however, he does expertly show the struggles early Mormons faced in trying to navigate the line between tolerable difference and execrable Otherness. In Carter’s view, Mormons have always yearned to be just a variation on mainline Americans and reflected this in their attempts to match their fellow citizens stylistically. Carter defines himself in the preface and an insider-outsider in Mormon culture (raised in Utah, but not Mormon). This position allows him to make the religion legible without bogging down into unnecessary tangents that mar many attempts to write about Mormonism. Building Zion effectively rewrites the narrative of the settling of the Great Basin as much less weird and un-American than it has been traditionally represented. In doing so, it pushes back against perceptions of Mormons as perennial outsiders. Instead, Thomas urges us to think of Mormons as the fringe of stereotypical America but not—as many others have argued—the fringe that defines the center. Mormon architecture tells us that Mormons have always yearned to fit in. How they managed to do that without giving up their religious differences is a story worth following, not just for students of Mormon history, but all scholars invested in how the American Dream gets built.